You see to a guy like me, rather a nerd like me, the marathon isn’t really an excitement inducing factor. 5 kilometres, 10 kilometres, and more, these guys who take part in the marathons, are just beyond my imagining. The question I’ve been asking myself whenever I hear the word Marathon is, how? How do the guys who do it, do it. What does it take to keep running continuously, without a break and push your capacities to the limit? At the end of it, it is you surviving all other elements trying to bog you down. I guess that why they call Life a marathon and not a sprint. You see it’s easier to win in a short race, but it takes a whole lot more to beat time and laps in a marathon. Although I don’t consider myself a fitness enthusiast, the sheer concept of a marathon is intriguing and exciting to me. More so even, when the same is being conducted in my own city, by the name Airtel Hyderabad Marathon 2017. Oh, wait did I tell you that this marathon (like the ones preceding it) would be the second largest marathon to be held in India. 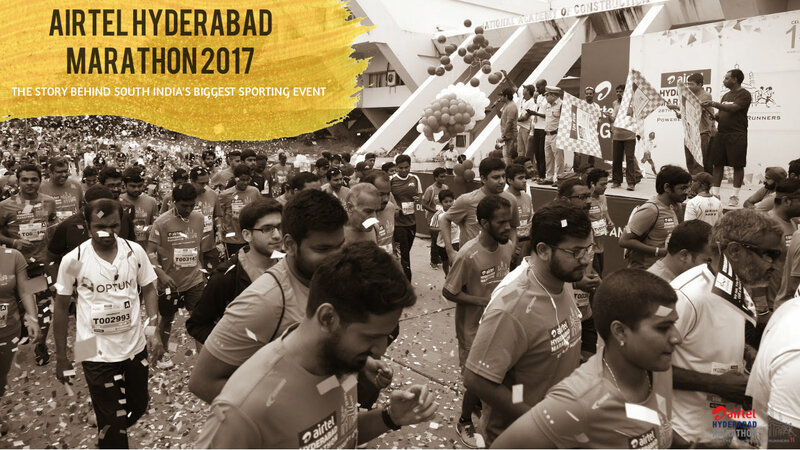 With thousands of participants, miles to cover, more than a forty associate NGO’s and countless sponsors, Hyderabad Marathon is the place to be this August 20th. We got in touch with organisers of Airtel Hyderabad Marathon 2017, to get to know more about the event, and perhaps get the story behind it. The following is how our conversations went. We see that the Hyderabad Marathon has its roots way back in 2011. Could you tell our readers how and where it began, and when you refer to it as Humble beginnings, could you, as you look back, tell us what did the Hyderabad Marathon stand to achieve at that point in time? From then to 2017, what are the few things that have truly accentuated the Marathon Culture within the city? The humble beginnings of Hyderabad Marathon start with its runners. Not just enthusiasts, but serious runners who took up on themselves to bring the culture of fitness to the citizens. It was in 2007, that five of these enthusiasts got together and start a little running group of sorts in the city’s centrally located KBR Park. Let me tell you, running was an unknown sport back then. Yes, people knew the fitness value of running, but to take it up a sport was a different thing. In such scenario, Rajesh Vetcha, and five others started the club, which would, later on, organise the marathons. The team started expanding over time, and here we are. The motive behind the movement was always simple – to promote a relatively inexpensive means to fitness and make people aware of it. Today, yes, with City on the brink of a face lift, with Metro projects and more, our planning has been taking its time. Rest assured, our numbers are only growing and the spirit of Marathon, is being carried by Hyderabad Runners proudly. Now that the event holds its 7th Edition, come this August 20th, how has the core committee of organisers contributed to its growth and promotion. Could you tell us how the Hyderabad Runners Society was formed, if at all for conducting these events on a regular basis? And since this is an annual event, how does the committee interact and ideate to bring out the best ways of conducting the next Marathon? Also, who are the constituents of the committee, if we may so ask? 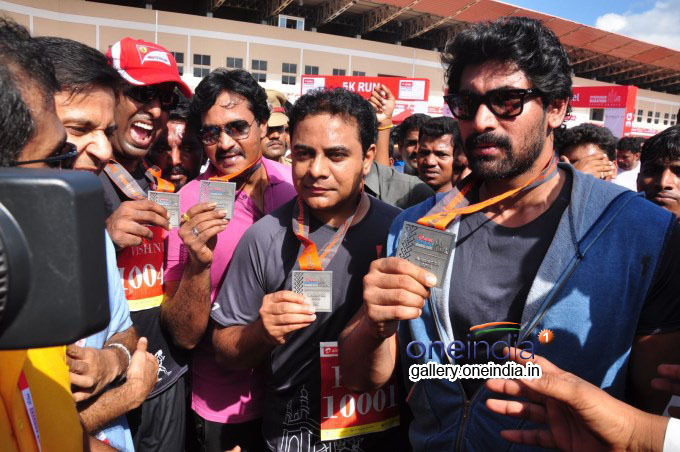 Yeah when we started off, Hyderabad 10k run was the only event at that point in time. Now apart from that Hyderabad Heritage Run was also being held, but it was quite irregular. We as runners could sense and see a need for a proper signature event for the city, which could really propel the factor of fitness across the country. In our pursuit, Airtel became our sponsor, and Hyderabad Marathon became the signature event. In August 2011, we had got about 1500 runners on the board, for the half and full marathons. This number only grew, as we further expanded our genres of participation. Interestingly, the routes which have started out with initially, remain the same even today. Back then, we didn’t have any word of mouth publicity or any other means of advertisement. Even so, we attracted a huge number of enthusiasts to participate. That’s all we ever wanted. It was always meant to be a volunteer supported event. In 2012, we incorporated relay runs, which again was a successful venture. Thus, this year, we already have 20,000 people participating in Hyderabad Marathon, across all the categories. Airtel which was already sponsoring the Delhi Marathon tried it out with us and were super impressed by the feedback it received and hence decided to stay back and sponsor this event as well. Now what makes this Marathon unique is its people and structure of things. Say the thrill of finishing the race at a stadium amongst the loudest of cheers, is a super kick in itself. The routes, I’d say are particularly chosen to be joyous, serene and challenging as well. Rolling hills, flyovers, University landscapes, and city plains, everything is there. The Topography is just so amazing. We are also providing some really cool goodies this year for the event, and of course, the medals which are specifically designed by acclaimed designers. The structure of Hyderabad Marathon committee constitutes of, seven office bearers (treasurer and joint treasurer and secretary) and 25 committee members (also invite select members – policy making decisions, accounts, events committee, finance). The committee is a non-profit organisation institutionalised formally in 2014. The core marathon committee has about 15-25 key roles during the marathon not necessarily limited to it. The founder of the committee as I said is Rajesh Vetcha. The group consists of a mix of 35% of women to a 65% of men. Also, we have a medical lead for this year’s event in the form of Dr.Madhumati. We will also be supported during the event by Care Hospitals providing us emergency services and basic CPR apart from ambulances placement. All of us, in the committees, are experienced in handling our tasks. Most of us working professionals in different IT companies and all of them are HR members. Today, we see that “Running For A Cause” Marathon is conducted across the city every now and then. To a layman, how effective are Marathons in propagating and perhaps addressing an issue? Over the past seven years, what are the issues that your organisation has taken up via Marathons, and how well have you addressed them in time? World major is the pick of the lot. Through our event, and sponsorship you can get in touch with over a 46 NGO’s contributing to the betterment of the world we live in. You get in touch with a charity and sign up to purchase bibs from them. Once you have them, you pledge them and extend your support to a noble cause. Airtel Hyderabad Marathon has in previous editions played a proud part in helping different causes be addressed and contributed for. In the past, we have done our part in lending support to Isha Vidhya. All the money you raise directly goes to the NGOs – we’ve ensured there’s 100% transparency in the donation process. Other causes that we continue to support is Heal a Child Foundation. So the spirit of running coupled with a moral responsibility towards growth and prosperity defines the marathon. It is a mammoth task to manage the needs of every participant in Hyderabad Marathon, and one which is so gloriously held. How do you guys manage to do it? Are there particular protocols that you follow and thus ensuring a smooth flow of things? Also, could you share with us a couple of incidents which you think have been deftly handled by your time in the recent past? All of our planning is towards providing the runner with the best experience at the event. Since the event is fully volunteer driven, we come with the core base of ideas directly contributed from the runners themselves. In this regard, we provide for medical emergencies, aid stations, refuel pods, and more for the participants. The protocols are such that they show fantastic support all along the way, and ensure a great terrain to run in. For someone coming from outside the city, this becomes an important vehicle for understanding what the city is all about. Coming to the incidents, well there are several fondly interesting things over the years. There were a bunch of Elite Runners, who showed up at the last moment, and made the event extra special. In 2012, a podium finisher in Mumbai Marathon showed up on the event day. He had dropped in directly from the railway station, and the only language he could converse was in Malayalam. There was no food or accommodation allotted to him at that point, and therefore, one of the runners invited him to stay back at his place. he finished on the podium here as well eventually. Also, there were these 5 to 7 runners from Darjeeling, who directly came to participate at the event. We had to pool up our monies to provide food for them, as they were hungry and a bit out of resources. So on it goes. We are curious to know your association with local authorities in bringing out these Annual events. Since we see that the full marathon happens across a stretch of 42.2Kms, how do you ensure that you have all the necessary consents from the city’s municipal and traffic authorities? What happens behind the scenes? Fortunately for us, we’ve never faced any sort of resistance from the authorities. The city officials see the potential of the event, both in terms of fitness awareness and cultural collective, and thus encourage it to become a festival of the city, and by the city. I must say that for 3 days, the economy of the city is also affected in a positive way since the event ensures that most of the hotels, guesthouses etc are all booked out. Hence, the authorities have always been extremely cooperative. Today we see that local police officials, also joining in the Marathon and propagate the culture. Even the NPA Post head of Narcotics team is an accomplished runner himself in the marathon. In 2015, we had KTR do a 5K run to flag off the event as well. Hence, we can safely say that Hyderabad Marathon is beyond any restriction and political afflictions as well. It is defined by the people participating and contributing to the cause. We see that the Marathon Culture in the city has yet to pick up as a community desired activity, one which is participated by a whole family as such. As the organisers of perhaps the biggest Marathon events in South India, what are your thoughts on that? Where do you think that connect seems to go amiss, and how do you think this event or the forthcoming ones will bridge the supposed gap? We could partly agree to that. The culture is on its way to be adopted as a life activity. Of all the formats of running, we observe that 5k run is the most fun, where lots of family’s run together. The parents and their children, participate in the event, making the event a cultural habit. Having said that, the culture of Marathon has a long way to go before it can be truly accepted from all the sections of the society. We believe we are on the right path to achieve it and will get there sooner rather than later. Here’s wishing Airtel Hyderabad Marathon all the success and celebration in this year’s edition. Go check it out here and run for a change on August 20th.